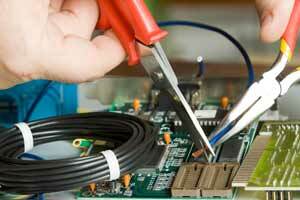 We provide comprehensive electrical contracting and maintenance services for a full range of industries. On every project, regardless of size or complexity, our proven team of professionals, including electricians, and service technicians, supported by a fleet of over 20 service vehicles, delivers quality workmanship and materials, specialized expertise, and consistently outstanding performance. And it's all backed by 24/7/365 services that's fast, responsive and effective. We also offer some significant additional benefits. As a single-source provider, we can give you high quality with price competitiveness and fast delivery. Our experience and sound management enables us to coordinate the diverse resources required for mission critical and other construction projects, ensuring on time delivery without interruption of day-to-day operations. Our experienced workforce and team approach allows us to excel at successfully completing projects with challenging design and installation requirements, fast-track schedules and tight budgets. The result is reliable, high quality electrical systems installed and running on — or ahead of — schedule and within budget.